A new take on the classic oat Bircher muesli. This dish is an overnight dish which can be finished quickly in the morning. Soak the groats overnight. In the morning place the drained and rinsed groats in a bowl and mix in the rest of the ingredients except the desiccated coconut and berries. Sprinkle over the desiccated coconut and top with your favourite fruit. I often soak the groats during the day and prepare the bowls in the evening, ready for the morning. This Bircher keeps well in the fridge for a few days. My husband loves this for breakfast, as well as Coconut and Chia Bircher. Both come from The Art of Eating Well by Hemsley and Hemsley. It is a very satisfying and filling dish. Note #1 Most pseudocereals, pulses, nuts and seeds benefit from being ‘activated’ by soaking for 8 hours or overnight. Soaking them increases the nutrients available and makes them easier to digest. As a rough guideline, soak in double the volume of filtered water using a glass bowl, loosely draped with a teatowel. When soaking pseudocereals, the addition of 1 tbsp lemon juice or apple cider vinegar is recommended for every 250 ml of water. 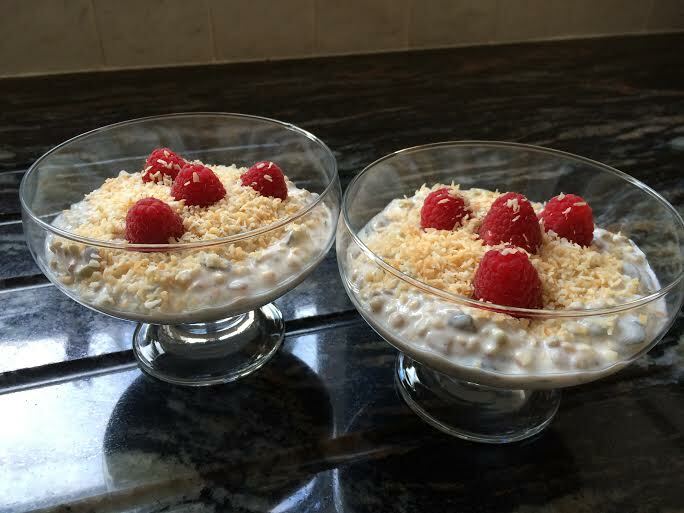 This entry was posted in Breakfast and tagged Bircher, Breakfast, Buckwheat, Coconut, Healthy Eating, Probiotic Yoghurt, Recipes. Bookmark the permalink.